As reported by Time Out New York, street artist Mr. Brainwash—a guy who is definitely not a fake person created by more-famous street artist Banksy—has put up a 9/11 memorial mural near the site of the World Trade Center. 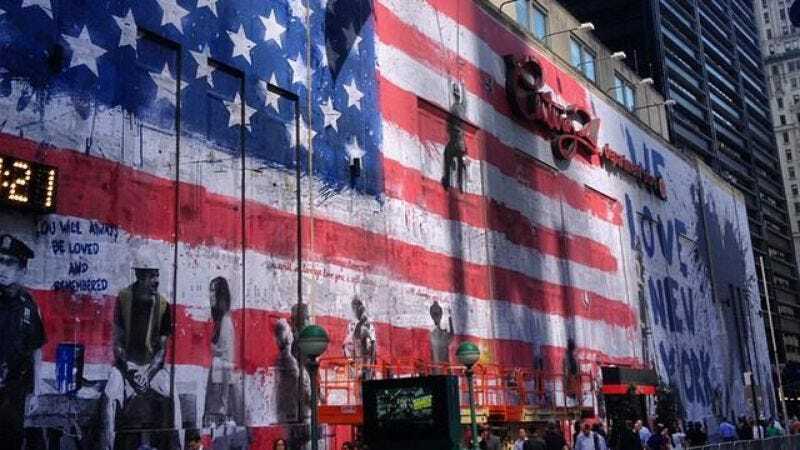 The finished work, which can be seen on Mr. Brainwash’s Facebook page, depicts an enormous American flag, a heart, and the words “We love New York,” and it will remain on the side of the Century 21 department store for the next three weeks. Gawker says the co-owner of Century 21 calls it “a tribute to the resiliency of New York City and all Americans after 9/11,” but others—including Gawker—aren’t especially impressed. However you feel about the mural, though, it does little to disprove the theory that Mr. Brainwash is just an elaborate Banksy prank. For anyone who hasn’t seen the documentary Exit Through The Gift Shop, Mr. Brainwash is the pseudonym of filmmaker Thierry Guetta, a man who tried to make a movie about Banksy and the whole street artist scene. In the process of doing that, though, he decided to become an artist himself, creating pieces that were reminiscent of Banksy’s shtick, but were significantly more marketable, derivative, and terrible. Of course, Banksy goes to great lengths to hide his identity, so it’s very possible that he not only created the entire Mr. Brainwash persona as a way to sell bad art to stupid people, but that he also made up Thierry Guetta so the Mr. Brainwash story would be more believable. It’s all very confusing. Either way, creating a 9/11 mural for a department store is exactly the sort of thing Mr. Brainwash would do, but it’s also exactly the sort of thing Banksy would do as some ironic statement, so we have no idea who actually made it. It was definitely someone, though.